Proceeds Earned Support the Owen J. Roberts Education Foundation Innovation in Our Schools Take a Break from Cooking! Patronize these local restaurants while helping the Owen J. Roberts Education Foundation Enhance Our Children's Educational Experience! Tuesday- Wednesday- Thursday- March 20, 21, 22. LUNCH OR DINNER. Please check with individual restaurants for hours/menu info. 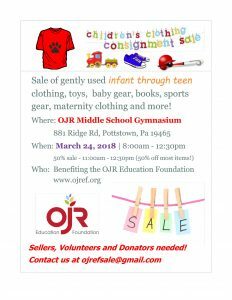 For more information contact Dr. Kathleen Hocker at 610.469.5333 or khocker@ojref.org. OJREF is a 501 (c)(3) nonprofit organization. Proceeds Earned Support the Owen J. Roberts Education Foundation Innovation in Our Schools Take a Break from Cooking! Patronize these local restaurants while helping the Owen J. Roberts Education Foundation Enhance Our Children's Educational Experience! 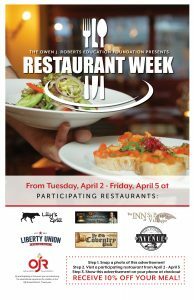 From Tuesday, April 2nd – Friday, April 5th at Participating Restaurants LUNCH OR DINNER. Please check with individual restaurants for hours/menu info. For more information contact Dr. Kathleen Hocker at 610.469.5333 or khocker@ojref.org. OJREF is a 501 (c)(3) nonprofit organization.